How did you come to make bears? In the Schaumber Show thread Kelly Dean told the story of how he came to make his first Teddy Bear, and I thought it would be fun if we all shared how we started. I can't remember if we have done this before, but I'm sure there are loads of new members who would like to share their stories. My story begins a long time ago when I received my first Teddy Bear from my parents as a sixth birthday present. I fell in love with that bear and created many crayon images of him (my first Teddy Bear art). Then, when I was nine, my dad built me a dollhouse. I checked a book out of the library called Dollhouse Magic. This book was a craft book for kids which showed how to make cute dollhouse furnishings out of household items, but what I loved most about this book was that the photographs had little Teddy Bears posed in all the rooms. I loved bears, so I decided that my dollhouse would not be a dollhouse, but a bearhouse!!! I was disappointed that the book did not tell how to make the bears, and they certainly looked like store bought bears, so I began to search for them in every toy department of every store. Once, in an upscale toy shop, I saw tiny jointed bears just like the ones in the book. Hooray!!! They were under a glass counter so I had to ask their price and when I did, my heart fell. $50 for tiny bears? I was only nine. How could I ever save that much money? I realize now that the bears were tiny jointed Steiff bears, but I had no idea at the time. (I think the ones in the book were Schuco) At any rate, I knew I wasn't going to get them, so I gave up on the idea of Bears residing in my dollhouse until I found an out brown velour shirt in the "Good Will" box and I asked my mom if I could have it. I thought it would make the perfect tiny bear! I drew a Teddy Bear outline (a gingerbreadman with ears basically) and stitched him together with the tiniest stitches I could make. I drew his face on with a marker--just a nose and eyes. I thought he turned out great!! I made a tiny sleeping bag for him and carried him around with me for weeks. I went on to make other bears, dolls, and stuffed animals as I grew up, mostly designing my own patterns, but other times using ones my mom found for me. I continued to do this even through college. As an elementary education major one of assignments was to create a learning toy or game for "early childhood". I made a Teddy Bear with clothes that helped with shape and color concepts as well as provided practice with buttoning, zipping, buckling, and tying. Then shortly after college (in the early 90s) I came across something wonderful, a copy of Teddy Bear and Friends magazine! I read with great excitement about mohair, and Teddy Bear collectors, and show,s and Teddy Bear Artists, and I realized, "I'm a Teddy Bear Artist!" Mine started out as my love of dolls. I always loved barbie as a young girl and made clothes etc for her, so that is when I learned to sew. I also loved making those cloth rabbits and rag dolls that were so popular around the early 80's so I should have known teddy bear designing was right around the corner. I'm like you Tami, I noticed a copy of Teddy Bear and Friends one day and then started looking at all of the artist bears on ebay, found this wonderful place and all of you wonderful artist and that is and the rest is history! I was always making things, mainly because the toys I wanted were never in the shops. So I made my own. It's sad to say, but my first two serious "bears" were...ugh, Pokemon. Mum was impressed that I'd worked the shapes out after watching her make bears for my little brother. I always preferred realistc aimals over bears, though. And there was a definite move towards fantasy. A couple years laer I came across Melinda Small's patterns on the internet. I bought her Dragon, her Celtic dragon and one of the Vasalisa projects. After made the two dragons, it finally clicked. Trial and error heped me work out the core basic shapes and how to build on them. From this I created my phoenix puppet, Illuvi, for my Year 12 art folio and my most popular dragon pattern, Gargus the Laying Dragon. I was lucky enough to have a brilliant art teacher who set up for me to participate in a needle-feltin workshop that ran over two weekends with Winterwood Studios and her visiting artist. This is where I made the little elf in my avatar. Again, I worked out the essentially shapes and how to build on them. Since then I've been playing around in my spare time, either working on commissions or on whatever projects take my fancy. But, essentially, I started out thanks to a crafting family and a fantastic art teacher. About 15 years ago, I was totally enamored with origanally sculpted dolls, especially the miniature ones. I still have several years worth of Doll magazines with original dolls from Fimo and Cernit etc. I decided to make a few and was pleased with how they turned out. I needed an accessory and decided to make a mini bear - he was two inches. I used to make larger stuffed toys for craft shows, so I knew how to draw up a pattern. I actually made my first bear when I was a child as well. I taught myself to sew on an old treadle sewing machine when my Mom kept insisting I was too young to learn to sew (oops, dating myself here! ) and then I would search my Mom's magazines for patterns for stuffed toys - and make them out of fabric scraps from her sewing. I made a lot of different creatures - dogs, cats, an elephant (which I still have! ), and rag dolls, but there never seemed to be any teddy bear patterns which I really wanted as I didn't have any teddy bears. One year my Mom located a European pattern for a jointed teddy and some dark brown rayon pile fabric which she gave me for Christmas and I was finally able to make my first bear - I think I was around 12 years old. I won first prize in the local fair - even had to enter him in the adult categories as there wasn't a stuffed toy category in the kids sections so I was pretty proud of my accomplishement - BUT I never really did like the bear that much as I thought he didn't look good enough - I could see all the things wrong with him that made him not look like a "store bought" bear. It was years later when I had kids of my own that I came back to making bears (over 20 years ago). 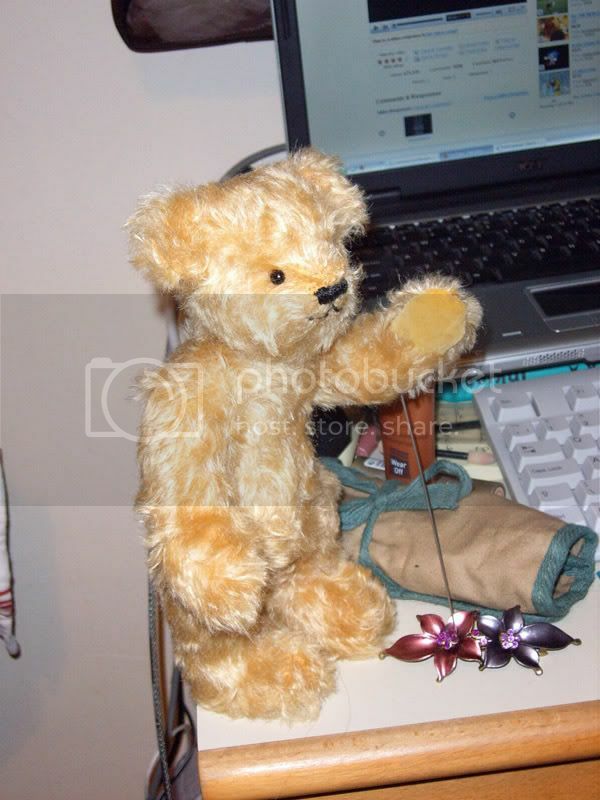 I had become a doll collector and was a sent a pattern by an acquaintance to make a 6" bear to go with a doll. I didn't like that bear after I made it up either so then I started drawing my own patterns for bears - beginning with minis when my eldest daughter saw a mini bear at a doll show that she wanted and I told her I would make her one as she didn't have enough money to buy it - and of course my money was all going into dolls! :crackup: The next doll show I did I had one little bear on my table and it was the first thing that sold. I light bulb went off - the felt and porcelain dolls I had been making at the time all had to be dressed which took a lot of time on top of making the dolls, and teddy bears didn't! - so I switched into making bears and have never looked back. It wasn't long before I began to really appreciate bears as much as the dolls and started collecting them too! I was useless at sewing...most of my lunch hours at school were spent with my friend Paula Nash, sitting fearfully outside the needlework teachers office to show her the re-sewing of the bit she had made us un-pick earlier, so everyone was very shocked when I made my first bear. I made it when my niece started collecting bears and I decided I could do better than the bears she had adopted ( that's rather cheeky looking back now) . I started with a kit..and then swiftly moved on to making a pattern after I went on a course run by Bear Bits. I was addicted after I went to my first fair..and have been ever since. I started my collection of bears with a Steiff Hot Water Bottle bear...and went on to buy a few more Steiffs as well as one or two artist bears. I have a lovely Wee Scone bear..and a few others... a few of Mikkis wonderful felties...!! One or two bears I think I bought on a whim and now they don't do it for me anymore but I would never sell them. My long time favourite is a White Rose bear I bought from my neighbour at a fair once and I adore her..I think she is beautiful..and my sister does too..she bought a bear from the same lady havig seen my bear! I love reading all these stories! Most of you will probably know the reason why I started, seeing as it was only just over a year ago! I wanted to make a personal gift for my Mum for Mothers day, as I'd done all her favourites (Chocolate Utopia chocs, jewelery, bags...) for her birthday and Christmas, which sadly all fall in the early year- not much time to thing for a picky mother! I've always loved bears, (although my childhood toy was in fact a retro '80s Popple) and bought my first artist bear Tang (an Issy's bear) at the ago of 15 from the bear shop in Lincoln, although I didn't know what an artist bear was! I really wanted this deans bear with an open mouth complete with clay jaw, teeth and tongue but he was £200... I wish I could track one down now! Tang remains my only artist bar, but we did buy another from the lady who made him on ebay for a friends birthday. So, back to the story at hand- I googled A LOT and found Bear Basics, and bought their 'Thomas' kit, which I sewed fairly poorly (MASSIVE stitches! Little stuffing!) but he remains one of my favourites because I cannot for he life of me replicate his face, no matter how hard I try! Grrr! I changed the stitching lines as I made him, so I don't kno what it is that made him so cub-like and simple.... one day I will know! My sister asked me what I wanted to do if price and talent weren't to be an issue when I was lamenting that I no longer had a hobby. And I gather most of you know what my answer was......."A Teddy bear"
Where on earth that came from I have no idea. I didn't even realise I was a bear collector. All the teds and other stuffed animals were gifts from friends. Cherrie and I went into a book store in Whyalla in SA and looked for bear making books. I chose one by Rose Hill. It took two more years before I made a bear though. Cherrie sending me bear inspired gifts. Which I treasure. I should have been embarrassed by my attempt. I wasn't though. He wasn't a finished product you see. He was a step towards something that I couldn't put into words. I still can't. The moment I finished I looked him over and reread the instructions in the book and so many things 'clicked' and immediately I proceeded to make another. I was making around 4 bears a week during my first year. I gave them as gifts and to charities. I worked with a fevered passion. Not until I found the bear community online did I come into my own. And I owe alot to the TT community for showing me I didn't have to be a perfectionist and that its OK to be me. WOW, what great stories... very inspiring! My story is that I am very new in the bear making business, yet it has been years in the making. When I was little I used to sit and watch my mom sew. I would beg her for the scraps and would make weird and unusual things. Then I eventually got to "play" with the sewing machine and make pillows and misc. I high school home economics I was the "best student in the class"so the teacher said. I never had a problem making anything from a pattern. I played around making stuffed animals from time to time. It wasn't until I had children 21 years ago that I started making stuffed animals on a regular basis. One year my oldest daughter wanted a horse. I found a pattern to make a life sized miniature horse... so away I went. At one time it looked like I was a veterinarian doing surgery sewing up the horses belly! :crackup: She loved that horse. I also took her ratty old baby blanket, reinforced it into a pillow. She still sleeps with it... at 21 years old! So how did I get into bear making? Well... I got a divorce 9 years ago and my sewing stopped as I had to work, work, work. I met a wonderful man 2 years ago and we moved in together. My many of hours of work eventually slowed down and I got back into sewing. I started out making bears out of special material for loved ones. Since I have made animals in the past I wanted to get back into fur. Sewing with a pattern as I said is a piece of cake. I wanted to go beyond a pattern and design my own style of bear. I have a dog that I got shortly after my divorce and named him Tucker as he always tucked himself next to me. He has been my teddy bear. Looking at him he has become my inspiration to my own design in my head. Not knowing a thing about designing my own pattern I got a book by Nancy Tillberg. In looking through the book I found that she had on line classes EbearZ University. I jumped on the opportunity to learn all the things I never knew you could do... open mouth bears... web sites... designing bears... etc. I am officially hooked! My goal is to have my own bear designed this summer as I work in a school and have 2 months off to focus on my design. Wow, if you made it through my long winded speech I applaud you :clap: Thanks for letting me share my story and thank you for being such a wonderful group of women. Now..... everyone sew! I was looking for a hobby and tried a few different things without any success then I saw a bear made out of pipe cleaners on ebay and thought I can do that. I hate sewing so it was ideal for me, So I bought a kit but no matter how I tried I could not get the pipe cleaners to resemble a darn bear. I then saw a mini bear kit and bought it and managed to do it and was hooked on my new hobby. Now I am amazed at myself and still hate sewing apart from my bears. My story started with a diagnosis of breast cancer at the age of 35. Two types really and very aggressive. I underwent a mastectomy. A couple of hours after the surgery, a nurse came in with a bear. She called it a Sojourn Bear. They are made by a group of volunteers for adult cancer survivors. She said "everybody focuses on children with cancer but the adults suffer too, so this group dedicates their work in making bears for adults". I was touch by this. When I got better I contacted the organizer of this group to thank her for the bear and the efforts of the volunteer sewers. I told her I did not sew but can I help in some way? She invited me to their monthly meetings. There I met Margaret. She pulled out a little mini bear. I was enamored with this little guy and asked how I can learn how to make one. Well Margaret gave me lessons and so my love of sewing began. Very Touching.... thank you for sharing your wonderful story! I really enjoy reading all of these stories. Michelle, yours in partitular has touched me as I have just lost a very dear friend to cancer. Of course I took a bear to her when she was in treatment. Bears are how I say I love you. But I like the idea of keeping it going for other people facing the same challenge. Thank you so much for the website! I WANTED AN ARTIST BEAR BUT COULDNT AFFORD ONE SO I BOUGHT A KIT AND IV BEEN HOOKED EVER SINCE...... THOSE KITS SHOULD COME WITH A GOVERNMENT HEALTH WARNING!!!!! I guess I started out as a collector, way before it ever occurred to me to create a bear! 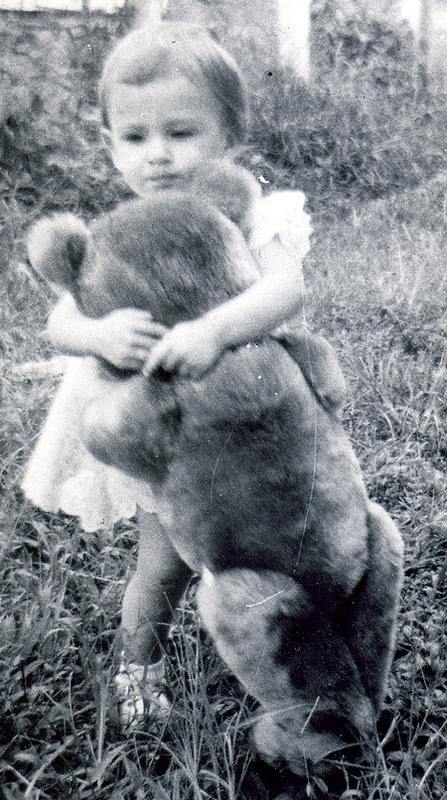 My own childhood bear ‘Big Ted’, presented to me on my first birthday, intrigued me for many years. I had been told by my parents he was purchased from ‘The Civil Service Store’ in Nigeria, while we were living there. Because of his size, he sat on my bed throughout my childhood, much loved and treated with utmost respect. I was working in school with Special Needs children in the early 90’s, when I came across Pauline Cockrill’s ‘The Ultimate Teddy Bear Book’ in a local store during my lunch hour. The fabulous pictures of vintage teddy bears hooked me right in and when I saw a ‘Big Ted’ look-a-like as I flicked through the pages, I just had to buy that book! Wanted to bring this great topic up again as I love reading your stories, so I'll tell you mine as well. As others, I came to bear making across the path of doll making. I think it was three years ago when one of our local bookstores closed and sold their books for lower prices - I, as a real book-lover, had to go and see what they had. It was there that I discovered a book about doll making, featuring around 20-30 doll projects from beginner's to advanced level. The dolls were an inspiration for me and I had to buy it. As I said before, I never was a very beary person. One day, looking through the crafts section at my local library, I found a little book about bear making - nothing special, in fact, the bears look rather common to me, and mine are so much better today - and I thought "Hey, I should be able to make a bear, shouldn't I?" By this time, I had reproduced the "Ich bin Ich" with a pinkish fabric with blue flowers that my mother had bought for me - so hard to sew with, fraying all the time and you can't pull the thread as it makes holes in the fabric - and had plenty of this fabric left that I didn't want to use for anything in particular. It was then that my very first bear was born, with embroidered eyes (I didn't know where to buy eyes for him) and button jointed although he is about 25cm high. I embroidered his name (César) on the pink bow I had made for him, and also embroidered my name and the date of his birth on his feet - I would look them up if he were not packed into a carton as we're moving atm. I also accentuated the flowers on the fabric by embroidering their outlines with a matching thread. He is absolutely a keeper. I doubt that anybody would want to buy him, but even if I don't like the color pink normally - I love him so much! I was boarding with a family in the early 90's as I was chronically ill and they very kindly took me in as I had no job and no money. There were 4 children and they all called me 'Clarebear' it was the first nickname anyone had come up with that I liked! A couple of years later someone said to me with a name like that I needed to make a teddy bear and bought me a book of patterns and some fabric. I had to teach myself how to sew first (a pastime I had always hated) but eventually i made a bear and it just went on from there. Some of the more memorable ones I have made were 'Chemo bear' for a friend with breast cancer and I painstakingly plucked out all the head fur which she thought was hilarious, I made another one for my friends husband after she died which was very much like 'chemo bear' but this time it had all it's fur intact and I made a large mohair bear that was donated to the chemo ward at the hospital with a pair of tweezers so that patients having their chemo could help pluck the fur out of it's head. Apparently it was very cathartic! I am yet to sell any bears as I feel that you can never recoup the cost of time that goes into the making of them and I prefer making them for friends, family and special occasions. I would rather give them away than undersell what their worth is. Wow, what fantastic stories, I have loved reading them all. I never collected many bears and I think the bear bug really started when my partner bought me a surprise sewing machine one Christmas, a few years ago, as I was moaning that I was struggling to find clothes to fit me as I am quite petite. He thought that I could just 'make clothes!'. I didn't have the heart to tell him that the sewing machine was gathering dust - unused, so thought back to my love of bears and wondered if I could possibly make one myself......and....after much sweat and tears, 'Mongo' was born! I had purchased a bear making book and created Mongo from extremely cheap synthetic fabric with more stretch than lyra! He had wonky eyes, wobbly ears and I won't even discribe the embroidered nose! But he did (vaguely) resemble a bear. Mongo still lives with us and sits on our laundry basket in the spare bedroom. One ear dropped off last week and I am trying desperately to now hide him away now, but my partner wants him on display as the birth of 'Boogaloo Bears'. I would like to think my bear making skills have progressed rapidly since Mongo and I guarantee that the ears no longer fall off my bears! We've always been a beary family - I got my first bear the day I was born! Poor old Elizabearth has been with me all my life, he's (and yes, you read that right, my male bear has a girl's name ) been all over the world, losing his growl in Nigeria (my parents think he somehow for damp, and as we left there when I was 2 1/2, I don't remember the growl), losing most of his fur on his arms and legs in Philadelphia, due to my thumb-sucking and limb-rubbing habit, and got a retread when we moved back to the UK. My dad got some cheap 'fur' from a fabric shop and covered his arms and legs. He managed to keep the leg joints movable, but sewed over the arm joints. I can still remember being told that Elizabearth would never be able to bend his arms again Poor thing has had a few wee holes darned by my mum, as well as a few nose thread replacement surgeries, and now languishes in my bed in an old t-shirt, giving hugs as required. For the first few years of my life we just had shop bought bears, mostly presents I'd been given, but one or two were mum and dad's, but then we ended up in Telford, which was for years the home of the West Midlands Teddy Bear fair. I remember going to our first one when I was about 8 or 9, and then we kept going to every one after that, even when they increased to twice a year. This was a great day for teddy bear artists, and a bad day for the bank managers I think, given the armfuls we would bring home! Whilst there were a few stalls also selling mohair, I had no idea how one might make a bear, and although my mum had forced me through some painful sewing projects, I didn't enjoy them one little bit! I've always enjoyed crafts, and making things, and when I went to uni I got into the habit of making the Christmas and birthday presents for my family, partly because it let me indulge in the crafts and effectively save money on the pressies lol By summer of 2002 I was graduating and saw a sign for a teddy fair in East Kilbride on my way to work one day. The fair only happened once, and had the grand total of 5 stalls! They did have a stall by the name of 'Bear Bottoms' who were from Durham, and with my extremely meagre amount of spare cash, I bought a pattern, mohair, eyes, joints, stuffing and thread. It seemed like it would be a great Christmas project, but it wasn't until 2004 that I actually made up 'Edward Fathingale'. Surprisingly he looks like a bear. Unsurprisingly he looks nothing like the photo with the pattern lol Actually, to this day I can't work out how he could have looked like the pattern, I think it might have been the wrong photo stuck to the pack! Anyway, since I worked in IT on databases, he was named Oracle. Having supplies left over, I was able to make another, from the same pattern, for my mum for Christmas. That was Sequel (and for those of you who know databases and just groaned, well, we have a terrible sense of humour in my family ). Over the next few years I sporadically invested in kits from sites in the UK and Australia, but it wasn't until I was working in South Africa that I was actually able to visit a real live shop selling things to make bears! I owe a lot of thanks to the lady at Honeydew bears (the owner's mother) who encouraged me to try my own patterns, and I managed to get hold of Teddy Bear Studio by Ted Menten which showed what you could do to get different effects, and how to make up patterns, so armed with the ideas I'd gained from there, and little techniques I'd come across in patterns I'd made from other people, I worked out my first bear. Well, I worked out my first pattern, and I'd bought all the mohair and things to make him, but I was so afraid of wasting the precious mohair (not just the expense, but the difficulty of getting hold of it!) that it lay to one side. Honeydew had even sold me some ultra cheap synthetic fur to do a practice bear on, but I was scared to even try that for 2 years! Eventually last year I had been making accessories for camera flash guns, and a friend suggested I make it into a business, which, sod's law being what it is, conincided with me being unable to get one of the main components any more without a trade bank account. Still, I also made jewellery, and thought I could sell some of that in the meantime. I happened to be chatting to a friend on MSN about it, and mentioned that I might also make a bear or two to sell. 'Great,' she said, 'I'll take 4 for my kids for Christmas'. Err, seriously?! Oooookay, I'd better get back on that pattern quick smart, and then design some more (this was October last year). Spike (my avatar bear) was the first off the production line, and I'd always intended to keep him in the family, giving him to my dad for Christmas, but the next 4 all went to Mand, whose kids loved them (thankfully!) I've been plodding away ever since, making my first 'real' sale in April (that is, one to a complete stranger who found my website, rather than a friend or family member!). I'm now stockpiling bears for my very first show, The Great Yorkshire Teddy Bear Event, in November. It was my mother who first introduced me to the jointed (artist's) bear. She owned a little lion (Leo) and a bear (Bruno), whom she had acquired during her childhood. They were both charmingly tatty and fragile. I looked on them with envy as I knew they were one childhood posession that my mother would not relinquish to my pleading. I settled for having them visit my bedside every time that I was unwell or scared at night: they both had excellent bedside manner. Failing to inherit Leo and Bruno as I grew older, I sought after a little jointed companion of my own. They were annoyingly hard to come by! The completion of this search was anticipated on every beachside-holiday (as a result of my mother explaining that the 'quirky' shops by the seafront may sell them). I did make several purchases, but none were quite the same as the little lion and bear whom I loved. 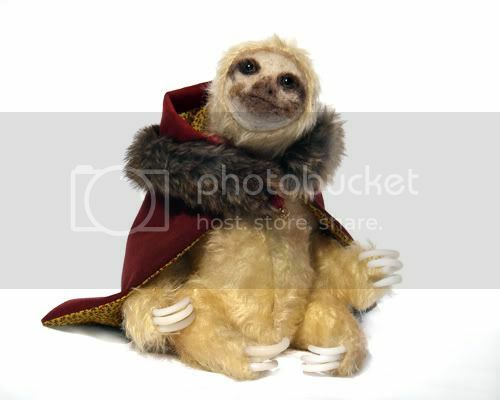 It was not until I discovered Etsy (at the age of 21), that I realised that these creatures were available to 'adopt'! They were called 'Artist's Bears,' and were handmade, OOAK (one of a kind) creations (most of which had little moveable joints-the feature I loved best about Leo and Bruno). I rang my mum and asked her to buy me a little jointed elephant from one Etsy shop as a Christmas gift. I was delighted that I could finally have a little jointed companion of my own! I began researching 'Teddy Bear art,' and started to make my own little bears and animals. I have always loved making things and I had loved these critters for so long that it seemed the perfect art-form for me to pursue. I have done so ever since. I hope that my little anecdote has both communicated the love that goes into my work and has brought a smile to your face. We all remember our little furry companions, and I am delighted at the thought that my little animals may find a place in another's home, heart and memory. i collected at first... and i was so worry as i have so many troubles to find old bears or sometimes no having many money as i wanted to create to always have bears in mind and hands! now its atherapy for me as they express all that i would say! !